With a stay at HOTEL SCHLOSSRESIDENZ HEITZENHOFEN in Duggendorf, you'll be 16.4 mi (26.4 km) from Regensburg Cathedral and 11.5 mi (18.5 km) from Oskar Schindler House. Planning an event in Duggendorf? This hotel has 732 square feet (68 square meters) of space consisting of a conference center and meeting rooms. Free self parking is available onsite. Located in Goch, Hotel Litjes is a 2-minute drive from Goli Theater and 9 minutes from Weeze Animal Park. The front desk is staffed during limited hours. Located in Ribnitz-Damgarten, Pension und Ferienwohnungen vorm Darß is a 4-minute drive from Klockenhagen Open-air Museum and 10 minutes from Rostock Town Gate. Free self parking is available onsite. 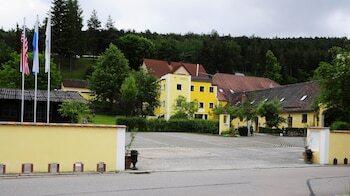 When you stay at Eifelpension Schebesta in Kall, you'll be 15 minutes by car from Eifel National Park. The front desk is staffed during limited hours. Free self parking is available onsite.